Here's an excerpt from 7Twelve: A Diversified Investment Portfolio with a Plan by Craig L. Israelsen. Excerpted with permission of the publisher John Wiley & Sons, Inc.( www.wiley.com ) from 7Twelve: A Diversified Investment Portfolio with a Plan by Craig L. Israelsen. Copyright (c) 2010 by Craig L. Israelsen. The 7Twelve portfolio is a completely strategic portfolio design. Strategic portfolios are built and managed by following preset guidelines that are not affected by whim, opinion or market gyrations. A strategic portfolio is often viewed as a more "passive" approach to investing because it does not imply, or rely upon, skill or market timing. Rather, a strategic portfolio relies upon commitment to the recipe and adherence to the preset guidelines. Strategic portfolios set a course and follow it. The opposite of strategic is tactical. A tactical portfolio is much more dependent on skill, opinion and luck. A tactical portfolio has a flexible set of guidelines that can change based on market conditions or opinions of the manager. A tactical portfolio may change course at any time. Each of the 12 mutual funds in the 7Twelve portfolio is assigned an equal allocation of 8.33%. The 7Twelve portfolio includes eight equity-based mutual funds that create an overall equity (stock) allocation of approximately 65% equity (66.6% to be exact). Four fixed income funds create a total fixed income (bond) allocation of about 35% (33.3% to be precise). With a 65% equity/35% fixed income asset allocation model, the 7Twelve can be categorized as a "balanced" portfolio because it has an overall asset allocation model that conforms to the general 60% stock/40% bond template. However, the 7Twelve portfolio is much more diversified than the typical 60/40 balanced portfolio. The 7Twelve design and asset allocation model does not change based on market conditions. The performance of the 7Twelve is, of course, affected by the performance of its 12 underlying investments, but the recipe does not change based upon the behavior of investment markets. Some people refer to this type of portfolio design as a "passive" approach. It rewards investors who exercise patience in following the recipe and who do not attempt to "overmanage" the portfolio. Investment portfolios that are actively changing based on market conditions are referred to as tactical portfolios. Tactical portfolios ultimately rely upon the skill of the portfolio manager to react appropriately to changing market conditions. A tactical portfolio would, for example, be much less likely to equally weight the ingredients of the portfolio. Moreover, a tactical portfolio will tend to overweight or underweight various portfolio components at the discretion of the portfolio manager. If the manager is correct, the portfolio wins. If wrong, the portfolio loses. It's all based on skill, and skill is actually very hard to find. Tactical portfolios are referred to as an "active" portfolio management paradigm. If you want to test the 7Twelve philosophy, set up a competition between two portfolios. The first portfolio could be the "passive" multiasset 7Twelve portfolio. The second could be a mutual fund that is actively managed and that relies upon tactical, market-timing skill. You will likely discover that a passive, multiasset core is a better starting point. To keep each of the 12 mutual funds equally weighted at 8.33% of the total portfolio, rebalancing must occur on a periodic basis (monthly, quarterly, or annually). How often the 7Twelve portfolio is rebalanced is up to each individual investor or his or her financial adviser. More on the mechanics of rebalancing in Chapter 6. A number of financial advisers around the country use the 7Twelve portfolio as the recipe for building their clients' portfolios. As the originator and developer (the "master chef," so to speak) of the 7Twelve portfolio recipe, I believe that its straightforward design and transparent logic is the most appealing aspect of it. You know what you have and you know how it works. If an investment portfolio is hard to explain, it will be hard to understand. If it's hard to understand, most investors won't want to use it. Alternatively, if a portfolio has a straightforward rationale with transparent rules, it will be easy to explain and easy to understand. That's precisely why the 7Twelve portfolio is being utilized by several hundred financial advisers. Advisers and their clients can quickly perceive the design concepts and rules of the 7Twelve portfolio recipe. And we know how fast good recipes can travel. The origins of the 7Twelve recipe began years ago. Like most recipes, it was refined over a period of time. The 7Twelve portfolio is the indirect result of more than 20 years of mutual fund research and analysis. I say "indirect" because I never set out to design a multiasset portfolio. In the process of writing an article for the Journal of Indexes in 2007, I gathered and studied long-run performance data for seven major investment categories, or "asset classes." The seven major asset classes included in my original study were U.S. large-cap stock, U.S. small-cap stock, non-U.S. stock, U.S. real estate, commodities, U.S. bonds and U.S. cash. The historical performance data began in 1970. This seven-asset portfolio was the forerunner to what is now known as the 7Twelve portfolio. The seven-asset portfolio represents a subset of the 7Twelve portfolio. While analyzing the performance of these seven asset classes, I experimented with different asset allocation models, or mixtures, of the various asset classes. Much like a recipe, an asset allocation model determines how much of each asset class is included in an investment portfolio. I tinkered around with various models in which varying allocations of each of the seven asset classes was included in a hypothetical portfolio. Then I had a strange thought (not unusual for me). What if I simply built a portfolio with equal amounts of each of the seven assets? The idea was simple. Rather than attempting to guess the right mix (which is a "tactical" behavior), perhaps I should simply build a portfolio that allocates to each asset an equal portion. The best part of this simple approach is that building a portfolio with equal allocations to seven major asset classes eliminates the reliance upon special forecasting skills or snazzy mathematical models to determine how much of each asset class to include and when to change the allocation recipe. The results were stunning. An equally weighted seven-asset portfolio provided excellent performance with substantially reduced risk compared to the performance of the individual ingredients (or assets) or in comparison to less diversified portfolios over a period of nearly 40 years. The best news is that the superior risk-adjusted performance was not the result of any special skill. Rather, it was produced by assembling a broadly diversifed portfolio and assigning equal allocations to all the ingredients -- and then rebalancing at systematic intervals. Some have referred to this type of portfolio design as naïve. I take that as a compliment. A naïve portfolio is one that acknowledges at the outset that transparent rules, rather than special skills, drive the results of the portfolio. But there is another important aspect of a simple, rules-based portfolio design -- namely, the issue of performance back-testing. The performance of a rules-based portfolio can be back-tested with confidence because the performance is based upon rules that anyone can follow. Conversely, portfolios that rely upon special managerial skills and real-time portfolio adjustments cannot be back-tested with confidence unless there is an assumption that the portfolio manager (i.e., "guru" ) always made the right judgment call historically. I've not met that person yet ... and I look under a lot of rocks. The fundamental principles from my seven-asset portfolio research in the fall of 2007 have now evolved into the 7Twelve portfolio: a multiasset portfolio that represents seven core asset classes but that is implemented by utilizing 12 underlying mutual funds. Again, the original seven asset classes from my 2007 model were U.S. large-cap stock, U.S. small-cap stock, non-U.S. stock, real estate, commodities, bonds, and cash. These seven were chosen because performance data back to 1970 was available. 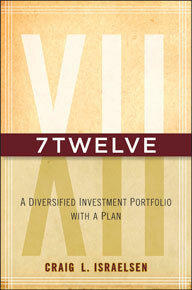 The 7Twelve portfolio represents an evolution of my original seven-asset model. It also utilizes seven core asset categories, but with several modifications. The seven core asset categories in the 7Twelve portfolio are U.S. stock, non-U.S. stock, real estate, resources, U.S. bonds, non-U.S. bonds, and cash. In the U.S. stock asset category, there are three underlying funds: large-cap U.S. stock, midcap U.S. stock, and small-cap U.S. stock. In the non-U.S. stock asset category, there are two underlying funds: developed non-U.S. stock and emerging non-U.S. stock. There is one underlying fund in the real estate category. There are two underlying funds in the resources asset class: natural resources and commodities. The 7Twelve portfolio has three fixed income asset classes: U.S. bonds, non-U.S. bonds, and cash. In the U.S. bonds asset classes, there are two underlying funds: U.S. aggregate bonds and inflation-protected bonds. The asset class of non-U.S. bonds has one underlying fund, as does the cash asset class. The 7Twelve portfolio made its debut in the summer of 2008. Its design was not a reaction to the gyrations of the investment markets in 2008 because it was designed in late 2007. As a strategic portfolio, the 7Twelve does not change with the wind. Rather, it employs 12 sails to catch a variety of winds. The 7Twelve portfolio can be the foundation of a preretirement accumulation portfolio or the core holding in a post-retirement distribution portfolio. The 7Twelve can represent your entire portfolio, or it can be a major component within a larger portfolio. However it is utilized, the 7Twelve design represents a fully diversified multiasset balanced portfolio. The word "balanced" is an established term that implies a mixture of stocks and bonds. The ultimate goal of this book is to make straightforward and implementable what has become complex and confusing to many financial advisors and individual investors, namely, the construction of a broadly diversified investment portfolio. The 7Twelve portfolio relies upon strategic rules rather than reactionary tactical portfolio adjustments. In summary, the three key guidelines in the 7Twelve recipe are selecting 12 different ingredients (such as mutual funds), allocating your investment equally among all 12 funds, and rebalancing the 12 funds on a periodic basis, such as annually. Chapter 3 is devoted to a discussion of the most defining characteristic of the 7Twelve portfolio -- broad diversification.